You can keep that trash and reuse it in all kinds of wonderful ways! Do you see that old jar? You can turn it into...a new vase! 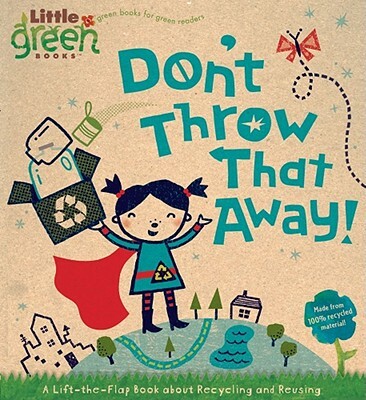 Follow an eco-conscious super hero as he teaches kids how to recycle and reuse common household items! The six large flaps throughout show that oridinary trash is really a treasure. From turning old clothes into fun costumes or an old box into a brand new car, kids will learn that saving the environment is super cool! Betsy Snyder has worked as an illustrator, designer, and trend consultant for both a children’s book publisher and a world-renowned social expressions company. Betsy and her husband reside near Cleveland, Ohio, with their two furry friends, little bunny Lu-Lu and old dog Hank. Don’t Throw That Away! is Betsy’s first book for Little Simon.